Ayden Thomas, a volunteer at the Campo Y for seven years, was honored last week (July 27) for putting in more than 5,000 volunteer hours. Rob Gray, executive vice president of operations for the Tampa Metropolitan Area YMCA, led the celebration. The first time Ayden Thomas was asked to speak to a small group at the Campo Family YMCA she was petrified. Seven years and more than 5,000 volunteer hours later, the 30-year-old has great confidence. And all those who she has spoken with through the years about the Y’s mission are now her extended family, she said. For Thomas, her hours volunteering at the Y, whether it’s to shred paper, help plan a budget or a special event, or speak to a group, it’s not only her job, but her passion. Thomas, born with spina bifida, is wheelchair bound. Her hours at the Y – about 16 hours a week – give her life a special meaning, she said. 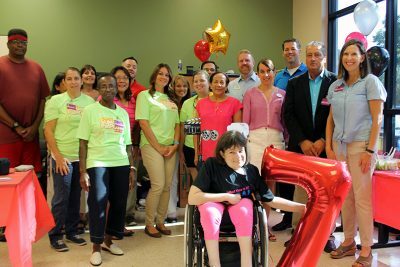 And Rob Gray, vice president of the operations for the Tampa Metro YMCA, said she gives special meaning to Y members with her brilliant smile and caring attitude. 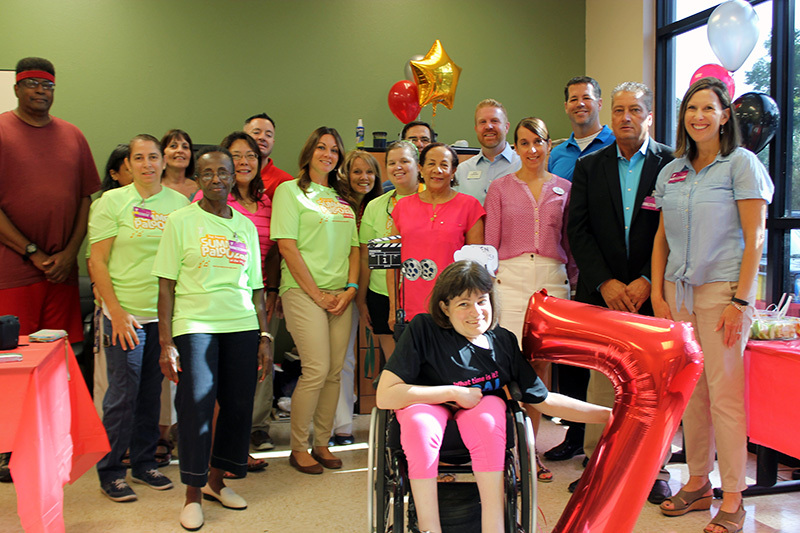 To show her their appreciation, the Campo Family Y staff gathered on July 27 to celebrate her high achievement. Thomas was first introduced to the Y through some neighbors who were on the lookout for something she could do outside the home, she said. She began volunteering the first day she met the executive director. “I started out with scanning in the office, and I really didn’t do much. As the years evolved, I have done scanning, helped out in the play center and helped with the annual giving campaign we do on a yearly basis. Sometimes, when it’s dance recital time, I’ll help keep an eye on the kids because we have young ones, age 2 and up from there. “It’s been fulfilling for me in many ways,” Thomas said of her Y time. “It has allowed me to get out of the house and have something to do a couple days a week because otherwise, if I didn’t have this, I would not have much of an opportunity to do anything.